As you learned in other lessons, making a Gear Ratio change is one of the easiest ways to change Mechanical Advantage in a mechanism or system to achieve desired speed and/or torque. 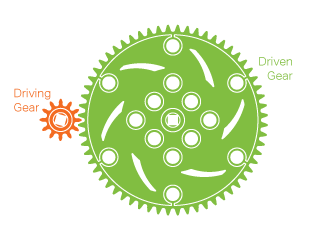 Gear Ratio expresses the relationship between a Driving Gear (the gear connected to the input power source, such as a motor) and a Driven Gear (the gear connected to the output, such as a wheel or mechanism) in a system. When you have a system with a Driving Gear that is SMALLER than the Driven Gear you will increase Torque and decrease Speed. Making this kind of change to Mechanical Advantage is helpful when you are trying to move slower mechanically, lift heavier objects, and/or have more pushing ability. Making this kind of change to Mechanical Advantage is helpful when you are trying to lift or move faster mechanically, you don’t require the ability to lift heavy objects, and/or you favor agility over pushing ability in a drivetrain. Both Gear Ratio and Gear Reduction are mathematical expressions that describe the relationship between a Driving Gear and a Driven Gear. However, It's important to understand the different, but similar ways they are expressed. Both use the number of teeth on each gear as key values, although their order is reversed. Note: Gear Reduction is seen as a fraction that is often reduced to simplify the expression. Say "12 to 36 Gear Ratio"
Say "3 to 1 Gear Reduction"
Say "12 to 60 Gear Ratio"
Say "5 to 1 Gear Reduction"
A simple Gear Train is a connected set of rotating gears that transmits power from an input (like a Driving Gear connected to a motor) to an output (like a Driven Gear connected to a wheel or mechanism). Simple Gear Trains can have any number of gears in a single row. All gears in between the Driving Gear and the Driven Gear that only transmit power are known as Idler Gears. Idler Gears have NO EFFECT on Gear Ratio or Gear Reduction, regardless of the number of teeth they have. In all three of these example Gear Trains, the Driving Gear is 12-teeth and the Driven Gear is 36-teeth, thus the Gear Ratio for all three examples is the exact same - 12:36 . 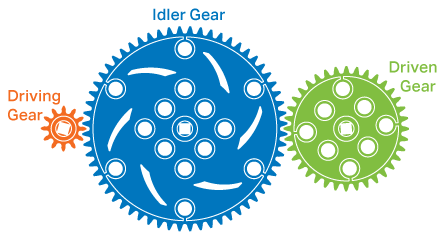 Size and number of Idler Gears have no effect on Gear Ratio or Gear Reduction, they just transmit power! In certain situations, a design may require more mechanical advantage than a single gear ratio can provide or is otherwise impractical. 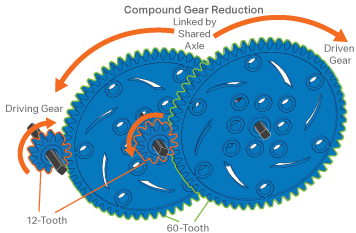 For example, if a VEX IQ robot design requires a 12:500 gear ratio it is a problem because there is no 500-tooth gear available. In this situation, a designer can use multiple gear reductions in the same mechanism. This is called a Compound Gear Reduction. 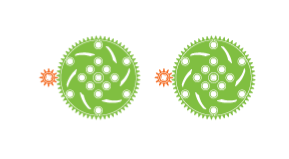 In a Compound Gear system, there are multiple gear pairs. Each pair has its own Gear Ratio, and a shared axle connects the pairs to each other. 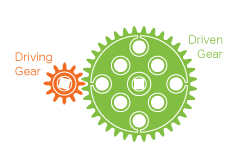 The resulting Compound Gear system still has a Driving Gear and a Driven Gear, and still has a Gear Reduction. However, it’s now called a Compound Gear Reduction and is calculated by multiplying the gear reductions of each of the individual gear pairs. Say "25 to 1 Compound Gear Reduction"
That means the output (Driven Gear) shaft is 25 times slower than the input (Driving Gear) shaft, and has 25 times as much torque. Compound Gear Reductions add up quickly!